An island of truly captivating wonder, Bali offers something for everyone. Be you after beachside getaways, cultural discoveries or thrilling adventures, this enchanting island has it all! 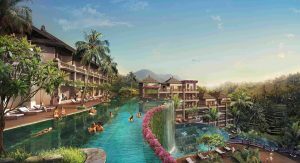 Collectively, the island’s beaches are amongst its main allures and when looking for the perfect couple’s getaway or best family resort in Bali, find one beside the shoreline. The beaches at Tanjung Benoa provide lots of water sports fun, while Nusa Dua, Kuta and Seminyak are also very popular and each offer something different to experience. should visit in the evening to catch a magical sunset and a traditional dance performance too. This ancient forest near the village of Padangtegal is not only home to three temples, but hundreds of monkeys too! Exploring the forest and seeing these monkeys interact, play and boldly come close to you is quite an experience indeed. Tip; be mindful of your belongings lest a monkey snatches them away! Set amidst breathtaking natural landscapes, the Ayung River is one of the best places for white water rafting in Bali. Featuring Class II-III rapids, it offers plenty of excitement for the whole family. For more rafting adventures you can also try the Telaga Waja and Melangit rivers. Goa – Perfect Beach Vacation – your tan awaits! It may very well be India’s smallest state, however, Goa packs an enormous punch in terms of sand, sun and spirits in all its festive feel. 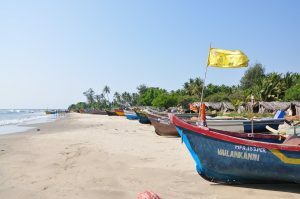 Want to know more about Goa for when you visit? Heading over to Goa is pretty easy, but it’s best if you visit somewhere between Mid-November and Mid-February. Transport within the city is plentiful, you could book yourself a taxi in advance or you can simply hire a car, motorcycle or even a scooty to explore by yourself. Goa holds immense pride in regard to its flea markets. Rightfully so as you’ll find plenty of them scattered around. Here you could shop to your heart’s content as you’ll find cool clothing, accessories, handicrafts and various other knick-knacks. The places to eat and excite your taste buds in Goa are endless. Great options include Martin’s Corner and Antares. You can even opt to eat where you’ve booked your accommodation. There are plenty of 5-star resorts in Goa that serve up excellent food and lodging options, like Alila Diwa Goa for example. If simply lounging out at the beach is not something that excites you, Goa will serve you even better. You can check out some amazing activities like Hot-air balloon rides across the lush countryside or any one of the festivals or carnivals that are bound to be around. Travelling is an exciting thing to do, with every hour of every day spent exploring and sightseeing! However, there are several reasons to continue with your usual yoga schedule even when you’re on the move, listed below are a few of these reasons. Travelling is spontaneous, fun and exciting! While deciding your trip to the Maldives, hotel booking and planning your travel itinerary, things can get a little stressful without you realizing. Yoga is the way to de-stress after that long flight and never-ending queues at the airport! New environment, culture, language, and surroundings all at once can be a little much. Stop for a moment and practice yoga, which in turn will help you reconnect to your mind and body. It’s important that you stay confident and strong as you explore! If you’re travelling with a bunch of other people, and you need your space – yoga is the answer! Sometimes sharing a room with others can get a little chaotic, especially if you value your own space. Pick the most serene location at Adaaran Select Hudhuran Fushi, lay out your yoga mat and take all the time you need! Maintaining balance is vital, this way you don’t feel too exhausted during your trip or after. Use yoga as a means of feeling well rounded and balanced as you travel! This way, you’ll wake up each day feeling refreshed, ready to take on another adventure!